Hey everyone! It’s been a couple of days since I last blogged. 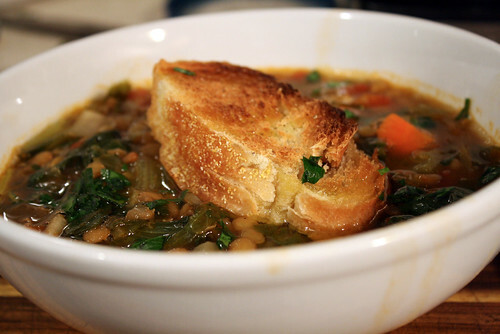 Last week I made a very tasty and healthy Lentil & Escarole Soup from the Mediterranean Vegan Kitchen Cookbook. I have been wanting to try this soup for so long and I am glad I did. It had a very nice taste to it and the lentils created a nice thick broth which I loved. I don’t usually cook with lentils that much but this soup inspired me to use more lentils in my cooking! I recently got these awesome vegetable broth concentrated packets from Trader Joe’s and I must say they rock! They will definitely be used a lot in my kitchen! They made this soup taste really good without the trouble of making a vegetable broth from scracth. On Saturday, I made another awesome dish that I have been wanting to make for so long! I made the awesome Tofu Florentine from Veganomicon! I though this was very fancy in my option from what I normally eat for breakfast/brunch. The cheesy sauce rocks, I made mine with extra lemon. I just love lemon, I always find my self using more than the recipe says. I like how it gives food a nice light taste. The broiled tofu used for the Florentine was really good, next time I would probably reduce the water for the basting liquid so the tofu is more concentrated with the soy sauce-lemon flavor. I am so glad I found vegan English muffins! I looked for them in my regular supermarket and they had milk in them, but when I went to Trader Joe’s I found some awesome ones. This is definitely going to be a brunch regular! 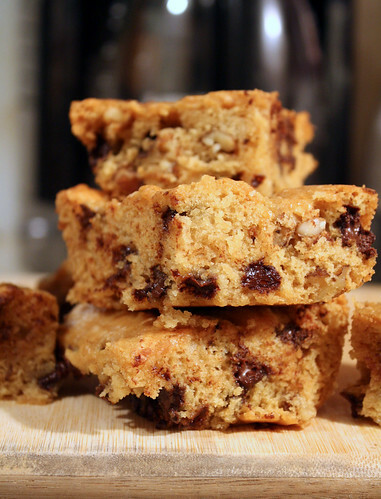 Here are some tester blondies from Isa and Terry’s upcoming cookie book! These were really tasty! Here’s my awesome and healthy green smoothie that I made tonight! I have just gotten into the whole green smoothie thing. The first one I made was awful, as I was low on fruit. 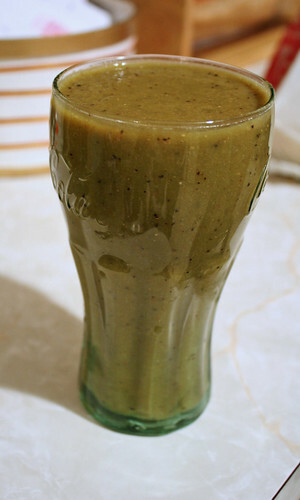 Then I started experimenting and made a great tasting green smoothie! This one was really good! For this one I used some leftover Escarole from the lentil soup that I made earlier, spinach leaves, a carrot, a banana, a couple of strawberries and blueberries, celery, parsley, pears, orange juice, and flax seeds. This blend makes a great tasting green smoothie and it is super healthy and makes you energized! Some of them may not look that good but the amount of vitamins you get from these is worth it! My family thinks it weird drinking green smoothies but I just tell them that you don’t know what your missing! It’s so good as long as you have a perfect balance of fruit and vegetables. I suggest everyone try a green smoothie, you’ll like it. Just try different combinations and see which one you like. Your body will thank you for sure! Alright everyone, blog to you soon in a few days! awesome recipes! i love lentil soups. can’t wait to try out those blondies, they look awesome! Oh man. Where have you been all my life? I see nothing but chompworthiness. You never let me down. Your blog always makes me hungry! Beautiful pictures. Aren’t green smoothies great? Of course the blondies and tofu florentine both look pretty delicious, too! I am so jealous that you get to test Isa’s cookie recipies! Mmmmm. Those all look excellent. 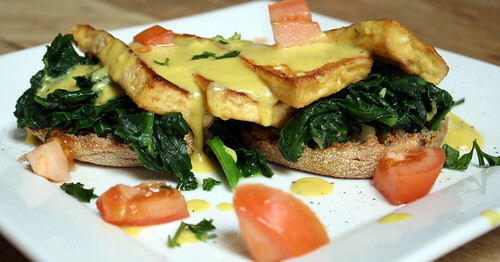 The tofu florentine especially looks mouthworthy. I swear everytime I return Veganomicon back to the library I spot another recipe online that I want to make. Nice job. Sweet potato blondies? Did I hear that right? WOW. « Hey Blog, I’m Back!